In a world filled with binoculars, spotting scopes, range finders, and many other optical tools, why would anyone want a monocular? 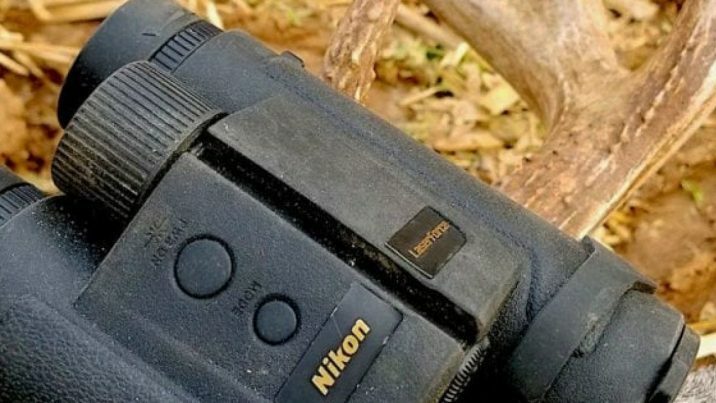 There are a variety of considerations that eventually lead to a nice in which the best monocular becomes a very viable tool. In truth, the whole idea of a monocular is to have a single, multifunctional device. It may not in any one way be better than another tool but has a combination of traits that make it a very versatile device. It can cover the needs met by many other optical tools. They are often as powerful as a set of binoculars with a field of view that is often the same if not larger. They weigh much less, fit in a pocket easier, and allow you to do anything a binocular can do. It’s likely that a good monocular will eventually replace the binocular as the portable tool of choice. Spotting scopes are a very specific tool that is often far more powerful than any monocular but are not usable by hand. Even a moderate spotting scope will need a tripod or brace to make it usable. When you can get by with less magnification, a monocular is a superior tool in portability, size, and ease of use. While a rangefinder is a monocular of sorts, it’s the electronics that allow it to do its job. While it will not be replaced by a monocular, rangefinders are specific tools that are often not needed. If you are after the magnification alone, a monocular has more power and is much lighter and smaller. As for the rest of the hand usable optical devices, if there is one you are looking at, compare them to one of the best monoculars available below and see what suits your needs best. With any job, having the correct tool makes a huge difference! 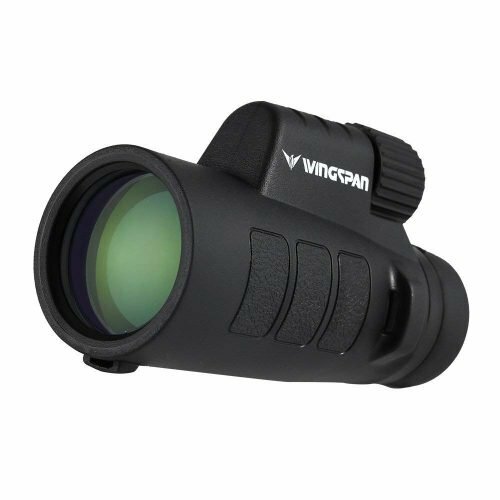 Wingspan has a wide range of optics, all of which are fine quality at amazing prices. They may not be as well known as some brands but they are quite prolific in the bird watching community where they have some avid followers. 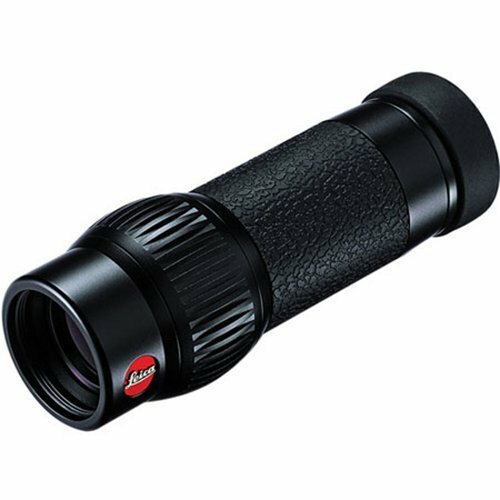 Quality glass, construction, and more than a little attention to detail make them a great choice in a mid-level monocular. For a start, this is a fixed 12 power monocular that has plenty of power for viewing at some quite long distances. Depending on what you are looking at, 800 yards is likely a reasonable distance. For the size, this is quite a powerful monocular. There may be a few with more power but not many. Optically, the wingspan is very clear and crisp with coated lenses that add to the brightness granted by the sizable 50mm objective lens. Combined with a top focus and roof prisms, you get more than a bargain when it comes to sheer image quality. For the price, these are some of the best optics you are likely to find. The entire scope is covered in a durable rubberized armor that prevents slipping and provides drop protection. On top of that, the whole scope is water and fog proof. This also prevents any issues with the intrusion of dust or other contaminants. 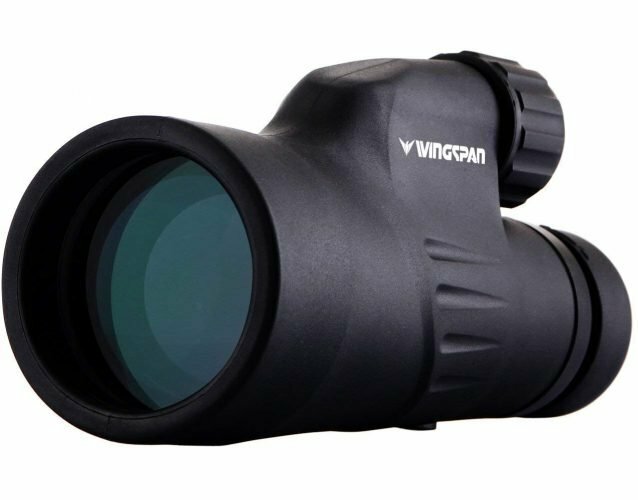 When it comes to the best monocular on a budget, the wingspan is a very good choice! 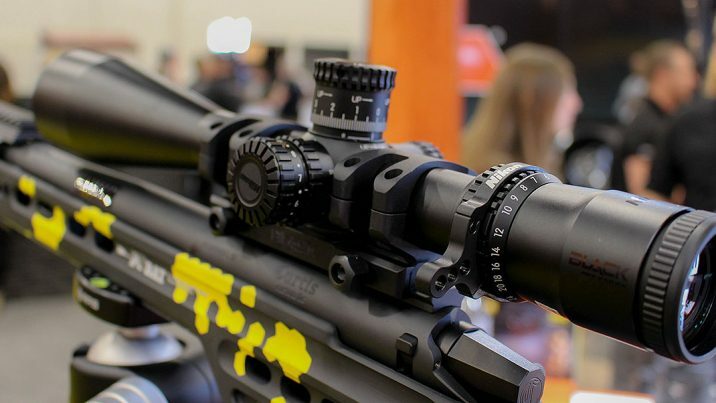 Xgazer is a newer maker of entry and mid-level optics aimed at the consumer who wants a powerful optic that won’t make too big of a dent in their budget. Being new, you often get quality much higher than the price would otherwise indicate. 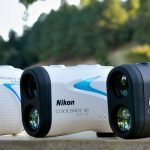 This is to help develop a reputation but plays well into the hands of those looking for a good monocular at a great price. The Point View model of Xgazer’s monocular line come in several powers from 8 to 12 with matching objective lenses for the best image quality. At the lower end, you are looking at a 500-yard scope but the higher end should get you closer to a thousand. It all depends on where and what you are looking at but whatever it is, you can be sure to get a great shot! Xgazer uses fully multi-coated glass on all of their optics for the absolute best in image clarity, crispness, and incredible brightness. This is partially due to the oversized objective but a little bit of refinement from the coatings is very welcome. The lenses are anti-glare of the best quality they can be for the price. Have no doubt that you will get all the detail you want with this monocular. With a soft-touch eye cap and fully rubberized armor that is 100% non-slip and drop resistant, this compact scope is ready for hard use. It may lack some weather-proofing but is otherwise quite durable and capable of standing up to some minor exposure to rain and moisture. All of this adds up to a durable scope that can protect the sensitive lenses and BAK-4 prisms to give it an exceptional, long life. 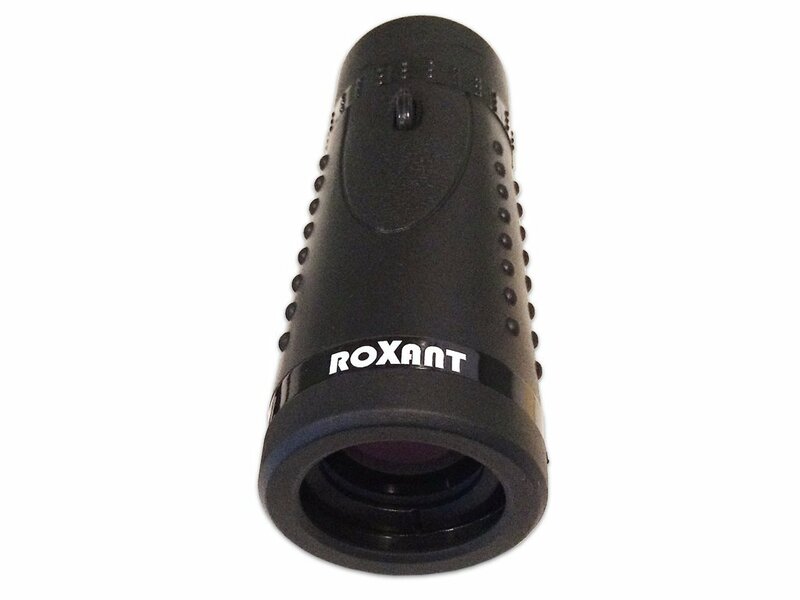 When it comes to compact, powerful monoculars, you can look to Roxant for the answer. They have been making optics using the same highly successful process for years and know a thing or two about what makes the best monocular. For them, it all starts with quality materials and a spot on the manufacturing process. This is the smallest scope we have selected, being only the size of the palm of your hand. That said, it is a 6 power optic which packs quite a punch for something that size. Perfectly usable up to 500 yards and maybe a little further, this ends up being among the most convenient monoculars you could ever own. Simply stick it in a pocket for those times you need it. Roxant uses optical grade glass the same as manufacturers that make much more expensive monoculars. Then they use their own recipe of multi-coating to add all of the clarity and vibrancy you could ever want from a scope. When you are only using 6 power, having the best possible image quality is absolutely necessary. It does have a rubberized coating that is less for armor and more for providing a solid grip. It also lacks any form of weatherproofing. 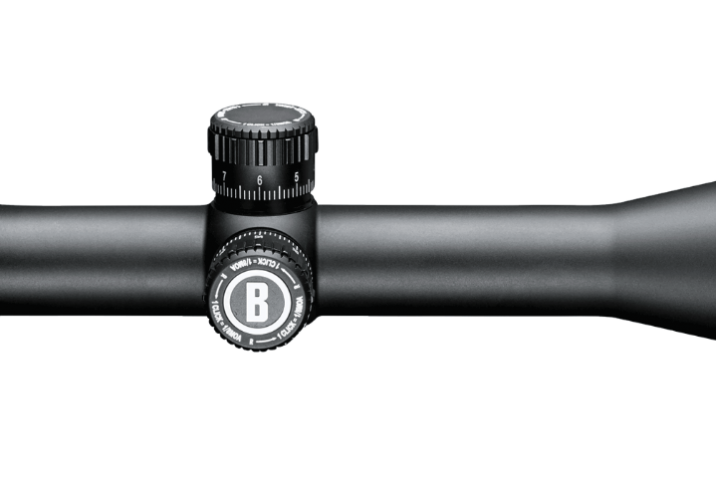 This scope is not designed for hard use but for those times at a ballgame or concert when you just want to see a little more. If that sounds like the use you need, Roxant has made the Grip series just for you. Avid photographers may recognize Leica from their top of the line cameras and other optical hardware. Without a doubt, they are among the best in the world when it comes to perfect quality. There is a price associated with such quality but if you are after the best, this is a product that is well worth the money. There are no downsides when it comes to the Leica Monovid. The tiny Monovid has impeccable lenses and when it comes to sheer optical quality, there are only equals. None surpass the precise, highly tuned lenses and perfect BAK-4 roof prism. Simply put if you are a sucker for the best image you can get through a scope, look no further. You will find it here in spades and nothing else is likely to come close. Lecia uses a central focus nob to tune their fully multi-coated lenses. When it comes to high-contrast, ultra-sharp, and impeccably clear glass, this is the top of the line. Made the same way they make their professional camera equipment, this is an optic you can bet on. When paired with its 20mm objective lens, you will get simply the brightest view possible. If there were a weak point in the Lecia it would be the durability. 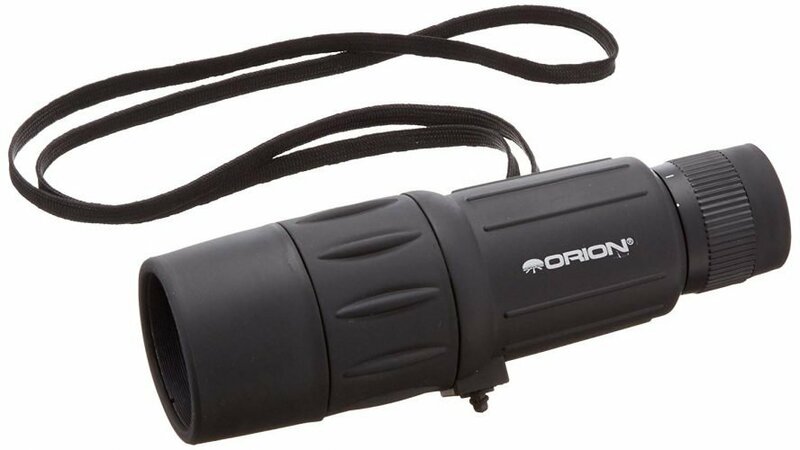 While it is backed with a limited warranty, there is no weatherproofing on this monocular short of the lens coatings and a sealed tube. While those are helpful, some rubberized armor would be a good addition to this optic. If you take care, this is supreme quality but not something you want to see hard use in the field. Everyone has heard of Bushnell and their many amazing lines of optics from rangefinders to rifle scopes. Well, they make an outstanding line of monoculars which can compete with the best of the best when it comes to quality. In the famous Legend line, they have added a monocular that is sure to blow away any outdoorsman and for a price that’s pretty hard to beat. As a 10 power monocular paired with a 42mm objective, this is hardly the most powerful monocular but it is near the top end for most companies. Out to 800 yards, you should have no issues what so ever. Not only because the Legend Ultra has quite a bit of power but the overall quality of the glass is absolutely astounding. When it comes to the lenses, Bushnell has the whole process nailed down to perfection. 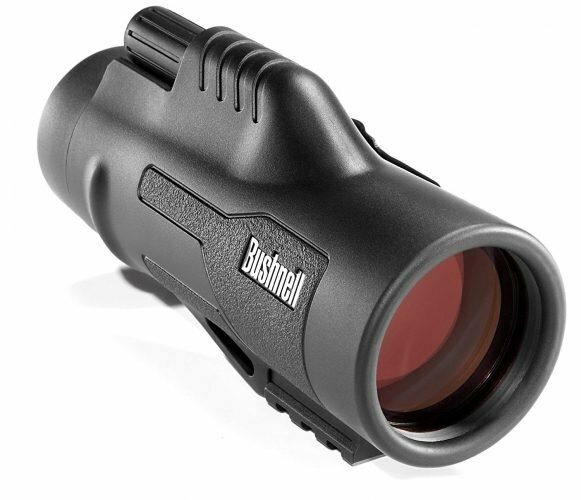 All of their lenses use Bushnell’s ED Prime Glass and multi-coat on every air to the glass surface. Even the BAK-4 roof prism is phase coated for perfect light transmission. All of this combined gives you a monocular that is sharp, bright, and able to see even in the dim woodlands. Designed for hunters and other outdoorsmen, this scope has all of the best in weatherproofing and durability. From the 100% sealed and purged interior for water and fog proofing to the rubberized armor to protect against drops and dings, this monocular should last a lifetime. If you want a scope that can handle the worst the backcountry has to offer while still providing the best optics you can get, the Bushnell Legend is the answer. If Wingspan sounds like a brand that interests you, they do have a few budget models that are noteworthy. While the price tag is noticeably lower, you won’t find a whole lot of difference in the quality. They may lack a little of the refinement and durability but if you can get by without that, this a great by! 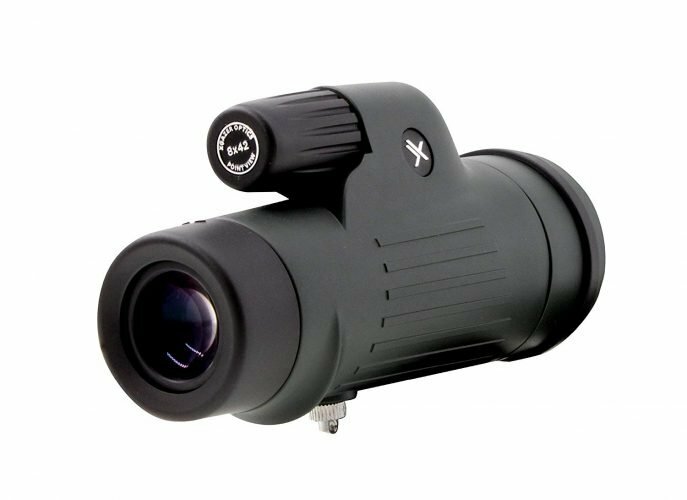 Available in an 8 or 10 power version, these are quite powerful and more compact than most other monocular in their price range. The magnification was not one of the places they made budget cuts to get a more affordable optic. As far as fixed power monoculars go, either the 8 or 10 power is a good choice for ranges anywhere from 500 to 800 yards. The optics are quite good even if they are lacking a multi-coating. The large 42mm objective lens lets in sufficient light to keep things bright while the BAK-4 Prism transfers a clean, clear image, no matter the range. While the overall image quality is unlikely to leave you awing, it will probably be enough to surprise most optics users. There are low-end scopes with advanced coatings that don’t look as clear. As for durability, you have to start with the lifetime guarantee. If it breaks under normal use, it will be replaced. Otherwise, it is water, dust, and fog proof and can handle smaller drops with its rubberized coating. This also makes it resistant to slipping from your hand or getting scratched up when stored. It even comes with eye caps to keep your lenses in perfect condition. Despite the price, this is still a monocular that will last a lifetime. GoSky makes a wide range of optics centered on the idea of telescopic photography with a smartphone. If you are going to offer this as your selling point, you have to make sure your optical quality is at the peak of its game. Any little mote or imperfection can have drastic effects on photo quality. And that’s not even mentioning the issues of getting the camera to reference with the lens. In the case of the Titan, you get a massively powerful 12x fixed magnification that should easily get you good imagery out to 1000 yards or more. Maybe not with the highest details if you are trying to get shots of something small but for landscapes, it is perfect. If you want smaller and tighter detail, you will be in the 300 to 500-yard range. That would be for birdwatching and similar endeavors. Fully multi-coated lenses combined with a generous 50mm objective lens gives your camera or eye all the brightness it would ever need to get that perfect shot. Combine that with an enlarged BAK-4 prism for perfect alignment and crisp, vibrant color transfer and you have an optic perfectly suited to photography. This is no easy feat and GoSky pulling it off so well is astounding. They didn’t forgo the durability features either. With a fully rubberized coating and included lens caps, you get the great impact and scratch resistance. Combine that with a fully waterproof, fog-free, nitrogen purged interior, and this will work anywhere you care to take it. It even comes complete with a phone attachment that fits most iPhone, Samsung, and other smartphones. In the world of optics, these reviews have covered almost every need but one, extreme power. If you want a clear view of something distant, no one can give that to you like a company that is renowned for its telescopes. Orion Optics has taken the lessons learned from years of making high powered optics and refined them down to a palm-sized monocular. What makes the Orion so special? How about a max power of 25x on a zoom monocular. It can be adjusted down to 10x which is still quite powerful but nowhere near what it does at the high end. You won’t see power like this very often from too many companies because of the many challenges involved. Where some companies can add to the optical quality for better results, when you get into the high magnification range, it becomes necessary. The 42mm objective alone would not give you enough light for a good image so they have had to pull out all of the optical tricks to make things work. The end result is a monocular that gathers light well and can give you amazing vista-like views, even in low light. This monocular has the standard rubberized coating that is quite comfortable to hold and highly slip resistant. It is completely waterproof and fog resistant for use in most environments. Being as fine-tuned as it is, it may not be as rugged and robust as similarly sized monoculars but it will hold up well enough. Just make sure to use the included carry case when transporting it for the extra protection. If you have been waiting for a true tactical monocular that can serve any and every need you might have, this is it. Hands down, Vortex is leading the industry in quality, affordable optics that outperform most other brands that cost far more. At twice the price, this would still be a value and loaded with quality and features beyond any other optic at this price. This is a mid-power optic at 8x and is fixed so that’s all you get. Not that 8x is a bad level of magnification, it is quite good at ranges you would normally want a monocular for. There are more powerful optics out there but none with features like the Vortex. It all starts with extra-low dispersion glass that is sure to capture every image perfectly. That is then refined down by Vortex’s own multi-coat and paired with a slimline 36mm objective lens. With the quality of every other process, Vortex can use a smaller objective and still provide out of this world quality. If you want better, you are looking at companies that specialize in glass only. 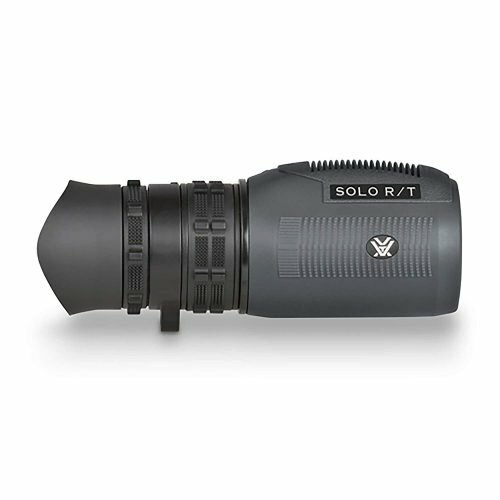 The Solo is mission ready with a reticle, large focus wheel and full weatherproofing. The internals are nitrogen purged and O-ring sealed for performance in any environment at any time. It has its own durable rubberized armor for a better grip and the ultimate level of damage resistance. If there were ever a monocular made for the tactical side of things, this would be it. If you came here with the goal of finding perfect glass combined with amazing function, the only place to look is at Zeiss. While many of the other companies have good glass and a few have great glass, none can compare with the company known for its lenses. Many of the best cameras and other optics use Zeiss lenses in their products because no one beats them. 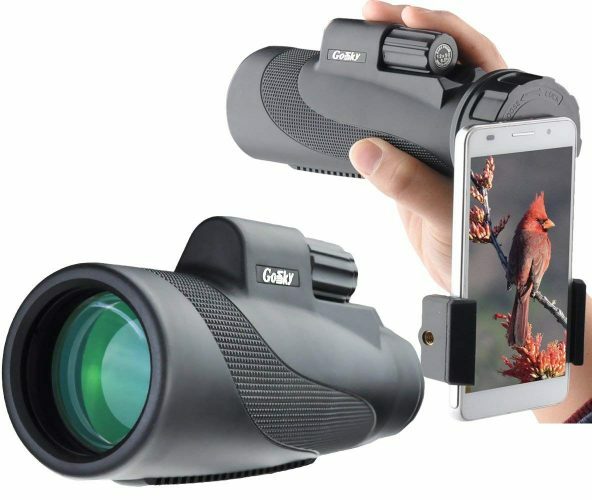 For a monocular that is this small and slim, you get a whopping 10x fixed magnification. If you wanted one power to do most any task, this would be it. The reason you get quality of this level in a monocular so small is the precision ground lenses that have made Zeiss famous. If the quality of the image is what matters most to you, this is the best monocular choice for you. The glass alone is not what makes this scope so bright, clear, and vibrant. Zeiss’ own patented anti-reflective multi-coating technology makes every view crisper while allowing a smaller 25mm objective. The overall effect is a slim and comfortable optic that fits in the palm of your hand and weighs nearly nothing. The Zeiss Monocular does have a no-slip rubberized armor and is quite resistant against rain and splashing water but it is not fully waterproof. Most environments, this monocular will perform perfectly. For those who need more durability, you may want to look elsewhere but for overall quality, nothing beats this monocular. All things considered, for most people, this is the best of the best. So, when it comes to monoculars what should you be looking for? No two are the same or even have the same setup. Understanding what you are getting is vital for choosing the right product. You have to know it’s limitations and functions to make an educated decision. Below is a list of the many possible criteria you could encounter when looking at a monocular. The best monocular for you may not be a universal decision. Consider the points below well before you pick the right monocular for your needs. As you read through the below list of considerations, you will see that they are all interconnected in some way. Changing one can affect many, if not all, of the others. With any optical device, the number one factor deciding how well the device works is the overall quality of the lenses. There are some things that can be done to make poor quality lenses perform somewhat better but nothing will fully rectify the issues you get with bad glass. This is one of the reasons you should make sure the monocular you are buying is one of the best monoculars on the market today. How can you tell if the monocular you are looking at has good glass? That is a hard thing to do; most companies don’t advertise that their glass is junk. You really have to go by the overall reputation of the company as a primary guide. Price can also be a good indicator of the overall quality you are going to get out of a monocular. Poor quality glass can make your view cloudy and dim with dimness being the first sign of bad glass. If you get a monocular that makes the view look like its twilight, your best bet is to return it. The good glass should leave everything looking crystal clear. Everything added to that glass should improve the view and make things sharper and brighter. The worst glass will have bubbles, motes, and visible imperfections that will always be there. There is no way of improving glass like this and the companies that use it should be admonished. There is no excuse for selling an optic with glass this inferior on any product. This is the trademark of the worst monoculars and other optics. Some companies have become well known for the glass they use. Companies like Vortex and Zeiss use some of the clearest glass and therefore produce the best monoculars. These are the gold standard and what other companies should aspire to. While the quality of some of the monoculars listed above may be better than others, any of them should provide you with a crystal clear view. Some will have superior brightness, contrast, or clarity but on the whole, they will all perform well. If not, they would have never been selected for this list or in any way be considered among the best monocular for you. When you begin your search for any optical device, power is almost universally the deciding trait in what you get. There is an obsession with getting the monocular or other optical devices that simply have the largest numbers. It is undeniable that a monocular should be chosen based on its overall power and performance but sometimes other factors can be just as important. So how do you know the power and what does it mean? On any optical device, there will be a number like 10×44 or maybe 8-12×44. In this number, the first is the overall power. In the case of the hyphenated number, you have a zoom or variable power optic that can be sued at different powers. We will discuss that more below. Most monoculars will have power levels less than 10 and very few will ever go above 15 power. This is a restriction of the overall size of the device. If you got much more than that, you would need a monocular the size of a spotting scope and that would defeat the entire purpose and intended use of a monocular. What power you need will depend on what purpose you are going to use it for and how large a monocular you are willing to carry. Even the best monocular cannot be incredibly powerful while being tiny. This is something you will have to find the balance between on your own. Simply consider what you need and go from there. Anything less than a 5x monocular will generally only be useful for a couple of hundred yards. As you move into power in the range of 10, you can get 500 to 800 yards with some clarity. 15x will get you better than a thousand yards if all other factors of the monocular are of good quality. While more magnification seems better, there are downsides other than size to consider as you get more power. The main consideration is that more powerful optics need more light to maintain brightness. There are a few industry tricks that help to overcome this but there will always be limitations. 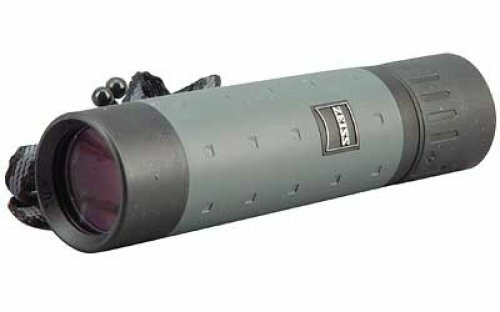 If you get a monocular that seems very powerful for the price, it is likely that the scope will appear dim. As we move forward, we will cover some of the ways that companies overcome this dimness as they increase power. If you want to understand more about the effects magnification has on brightness, this is a wonderful article by Wired.com that goes into all of the nuts and bolts of the process. If you can understand and apply the points discussed here, you will be far better off when picking the best monocular for your needs. In that example above, the 10×44, the second number is the diameter of the objective lens in millimeters. While this can affect a number of factors, the most important to most people looking for the best monocular is the overall brightness of the scope. Simply put, the larger the objective lens, the more light can filter through the lenses to your eye. Before we get into the other positives of a larger objective lens, you do have to consider what it does to the size and weight. Often the largest amount of weight in a monocular comes from the glass used in the lenses. As an objective lens gets larger, it will have to get thicker in the middle to maintain magnification. This can add significant weight proportional to the total weight of the monocular. What do you get for that added weight? In addition to being the number one factor in determining the brightness of the optic overall, the objective is the largest piece of glass and effects optical quality more than any other part of the monocular. If you have a bad objective lens or one that is improperly sized, you will see the quality of your monocular decline. Another area that the objective lens can affect is the field of view. This would be the size of the view at a given distance, we will discuss that more below. The larger the objective lens on a monocular, the more area you can see at once. Sometimes you may want to see a larger area for uses such as hunting but other times you may want more of a spotting scope. You can definitely get monoculars that do one or the other better. If you get a monocular that is better at seeing details at in a smaller area, all other optical components will have to be the best you can get. Otherwise, your scope is likely to be too dim to see much through it. For optimal performance, you are likely to not have to worry much about the overall size of your objective lens. Most companies have a formula that will give them the best sized objective lens for a quality image given the power of the monocular. If the scope you are looking at varies much from the average power of similar scopes, there may be an issue. If you are after the best monocular you can get, you want to look at competing brands just to make sure everything lines up. While having quality glass is vitally important to have the best optical quality, the nature of magnified optics makes glass along insufficient in some cases. In order to improve the overall quality of the image, most companies use coatings on their optics. These may achieve a variety of different effects based on the needs of the particular monocular. Before we go in depth about the effects of lens coatings, we should discuss the levels of lens coating. There are four levels you are likely to find on the best monoculars. You can get coated, fully coated, multi-coated and fully multi-coated. These are ordered from least to greatest effect but any coating on your optics is better than none. Coated lenses have a single chemical applied to a single lens, usually the objective lens. If you step that up to fully coated lenses, every lens will have that same coating for a multiplying effect on the image quality. While the effect may not be extreme, it is noticeable in most optics. Some optics that use cheaper glass will rely on a single coating to improve their optics. Multi-coated and fully multi-coated work the same way but with a variety of chemicals that may be applied as a mixture or as separate layers. In many cases, multi-coating on lenses will have a dramatic effect on image quality. This is a sure sign that the optic you are looking at is one of the best monoculars that money can buy. So, what can coatings affect? Generally, a coating is applied to filter the light in some way. Generally, this will be a chemical that affects what light colors are transmitted through the objective lens. While in truth it does not allow any more light to transfer through the lens, the manipulation of the light spectrum will make the image appear brighter, crisper, or add contrast. Some coatings are applied that will help to reflect the sharper part of the light spectrum that causes glare and mirage. In a more powerful optic, this is a vital component if a company wants to produce only the best monocular. Glare with magnification can limit the effectiveness of the optic and cause retinal damage. This is probably the most important coating a good optic can have. Other coatings may be preventative measures. Some coatings are designed to inhibit fog on lenses. Some optics have issues with fog if they are not completely sealed. A very few monoculars may also have a coating to protect the lens against scratching. With the cost of quality lenses, anything that can prevent accidents or even dust from damaging the lens is a welcome addition. The best possible monocular will be fully multi-coated with chemicals that refine the light for a better overall image. In addition to that, they should also prevent glare, fog and lens damage. If you can get a single optic that has these traits, you know you have found a true prize in the monocular world. Prisms in their own right are a complicated topic that can be difficult to understand but doing so is important to make sure you are getting the best monocular. Poor prism quality is hard to recognize up front but can make the image dim, out of focus, or even blurry. If a prism is listed for the monocular you are looking at, it’s worth taking note of. When an image is transferred through lenses, it gets flipped upside down. This change of orientation is in the physics of how light works. The prism has the job of making sure the image arrives at your eye in the correct orientation. Otherwise, using any type of optic would likely cause vertigo on top of being useless. There are two orientations of prisms that are often found in optics, roof prism, and Porro prism. They both do the same job but are oriented differently inside the monocular tube. As far as quality goes, you can get fine results from either prism type. Roof prisms are the newer technology that allows for very compact optic designs. These are small prisms aligned inside a tube that is directly in line with the objective and eyepiece. The best roof prisms are more expensive than other prisms and need to be higher quality to be as effective. Porro prisms are becoming more popular because of their affordability for the same quality as a roof prism. You can tell when an optic uses a Porro prism by the offset in the tube to allow for the proper reflection. To get high-quality images, a Porro prism can get by with slightly less quality and still produce a good image. With either type of prism, the best monocular brands will provide a consistently good quality image. As long as you get the end result you are after, either will work well. Typically roof prisms will be a more compact design but cost more. For a more detailed analysis of the differences and which are preferred, you can check out this very helpful blog post. If that isn’t enough on the topic of prisms, a brief discussion of prism materials is useful. There is a classification of prisms based on how they are manufactured. The only two that you will really need to concern yourself with are BAK-4 and BAK-7. BAK-4 are a much better option when it comes to prisms. These will be far superior to BAK-7 prisms but will cost more. While BAK-7 can produce a reasonably good image in lower magnification monoculars, you are better off to stick with BAK-4. If no prism is listed by the manufacturer, you can almost be sure they are using sup-par prisms. Focus, being necessary to actually use a monocular, is not always an option that is included. 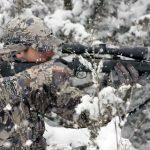 Some optics of lower power can get by without much in the way of focus but if you get a more powerful monocular, you will need to have some form of focus control to make sure you get the best the monocular can offer. If you are checking out any of the best monocular brands, they should all have focus adjustment. The issue becomes the location of the focus, how easy it is to manipulate, and the overall effectiveness. This can be a hard point to consider but an important one. The simplest form of focus adjustment is the eyepiece focus. This is the most cost-effective to produce as well as the easiest to adjust during use. On the downside, this tends to be the least effective overall. There is no mechanical advantage to the adjustment and in some cheaper monoculars, it works by just sliding the eyepiece. 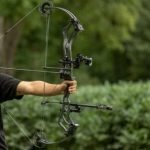 Getting a perfect focus can be very difficult with these types of adjustment. Tube-based focus adjustment has the mechanical advantage that eye-piece focus is lacking. This makes it far easier to adjust and fine-tune but still suffers from being not the most effective. The end results can make for a perfectly useable monocular that most people will have no issue with. The final form of focus is on the body of the scope. Rather than using simple rings to adjust the focus, it makes use of a mechanism that will adjust the distance between the lenses. These are by far the most expensive versions available only on the best monocular brands. Overall, they are very effective but can be tricky to adjust while holding the monocular. We briefly mentioned the field of view above as well as giving an idea of what the term means. But why is it a concern? Depending on what you want a monocular to do, the field of view can be very important. There is no universal ‘best’ field of view and they are not consistent between brands. This is one point where only you and your planned use can be the deciding factor. A narrow field of view will help you focus on smaller points and are useful in situations where you need to see only a small area in greater detail. This could be the case with uses in sports like golf as well as hobbies like bird watching. In both of these instances, you will not need to see much of what is around your intended target. Wider fields of view are often most used by hunters, sports fans, and in security roles. Being able to see the target without losing sight of the area surrounding it is a great way to stay aware of the whole picture. This can let you see not only who holds the ball but who they are throwing it to. You can see the deer you just spotted while still seeing if any other deer are hiding nearby. If you plan a variety of uses, most monoculars are somewhere in the middle. 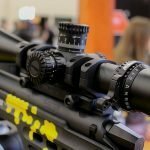 While this is a concession that means your optic is not the best for any specific purpose, it does mean that it can cover a lot of uses well. For most people, these are the best choice. The greatest majority of monoculars are in the hands of hunters who use them to augment their rifle scope. If this is the case, you will want something with a broad field of view. That way it can do the work your rifle scope is not capable of. When you need that tight in, detailed view you can go to the scope on your rifle. Most of the time you will see the field of view represented as a number of feet at 1000 yards. This is the distance you will see from one side of your view to the other without moving the monocular. While the overall effect can be hard to understand, this video provides some very good perspective on the topic. The greatest majority of monoculars are fixed power meaning the level of magnification is constant. The remainder has a range of magnifications in which they can be used. As to how beneficial each type is for you will depend on how you plan to use it and how much you are willing to spend. For two monoculars of the same quality, a fixed power will always be the better price. The addition of the zoom mechanism can add significantly to the price of a monocular. Though not always true, the best monocular is usually the fixed one on the topic of quality alone. This does not mean you can’t get a good quality zoom binocular but the best brands often specialize in a fixed power. In addition to having a better price, overall fixed power monoculars tend to have better optical quality and lenses that are specifically matched to function well at their magnification. For most people, this may not even be noticeable depending on how they use their monocular. However, if you want the absolute best monocular optically, get a fixed power. There is much more to say about zoom monoculars but the most pressing is their versatility. Having the ability to see a wide angle with a good field of view and then tighten that in to see detail is a huge asset. This is what makes zoom monoculars much more popular in most outdoor pursuits. You may also notice a slight difference in durability between a zoom and fixed magnification monocular. Zoom monoculars can be slightly more fragile if the zoom mechanism is not properly manufactured. Any time you add moving parts you invite a way for the product to fail. Even a small amount of dust can cause issues if the mechanism is not completely sealed. Often zoom monoculars are somewhat larger and heavier than their fixed counterparts. While it may not be enough to measure for most people, those who travel long distances and count in ounces may want to take this into account. Usually, the difference will be only a couple of ounces, if you are willing to carry the extra weight, the zoom may be a huge benefit. While far from a common addition to a monocular, some do have reticles much like a rifle scope. You will often see these types of monoculars used on movies and TV where the tactical type of character uses one to scope out a target. But is there really a use for these monoculars for the everyday user? For most people, the answer is likely not but I have never found them to be a distraction in the first place. They do add some versatility to your monocular that you would not have otherwise. If you never see yourself using a monocular for any of the following, there is little reason to worry about getting one. The primary use for a reticle is with long range shooters. With a reticle and a known level of magnification, a shooter can easily estimate range to a target. While most rifle scopes also have this advantage, it can be helpful to have a secondary device to get a second opinion on longer shots where small variables can affect accuracy. These types of monoculars have also been used in forestry to estimate the height of distant trees as well as their coverage when they fall. While rangefinders are taking over this role, it was the monocular that was used in the past. Very few people will ever need this function but should you ever be in the role of a forester or logger, it may be handy. Most marine binoculars and monoculars use reticles to be able to tell the distance and size of objects. This is often used as a navigational aid and probably beyond the realm of the layperson. However, this can be a rewarding hobby pursuit. Any decent monocular is an investment and one that is intended to be used outdoors. This means it can be exposed to dust, weather, temperature extremes, and the occasional drop or scrape. Having a monocular that can easily hold up to these conditions and potential abuse should be one of your first considerations. 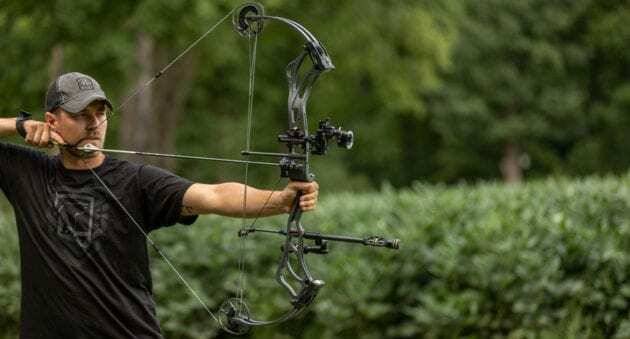 Of course, if you are a sports fan or bird watcher you may be able to get by with a little less but for hunters and other outdoorsmen, you should aim for the best. There are a number of features that can help with the resistance and durability. Many monoculars have a rubberized armor that prevents damage from small drops and scrapes. This can also help in weatherproofing to some degree depending on its construction. While these are important, the main benefit of having a rubberized armor is the improved grip it provides. It is far better to never drop your monocular than to have to rely on the armor to protect it when you do. A second feature that is very important in terms of protection is having a monocular that is completely sealed. This prevents moisture and dust from getting inside the scope. Over time both of these can cause damage and eventually ruin your optic as well as causing constant optical issues. An improvement on this is an optic that is filled with an inert gas like argon or nitrogen to prevent fogging. Having a monocular that has O-ring seals around the lenses does more than just help in keeping out foreign matter. This also prevents jarring damage to the lenses and their alignment. While not necessary by any means, this is definitely a sign you are getting the best monocular for the money. Because monoculars are often of non-standard sizes, finding lens caps that fit can be a problem. 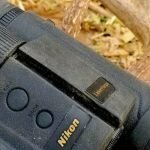 Most of the best monocular brands sell their monoculars with lens caps and they are a great addition. The lenses are the most important part of a monocular and protecting them should be the primary concern. A final note on damages is to get a monocular with a warranty if possible. Unforeseen things happen at the factory and in the hands of the user. This is just one more assurance that your investment is safe. In the grand scheme of things, how much a monocular weighs is probably a minor consideration. If you are a backpacker that needs the lightest gear, you may want to factor that in. Anyone who travels long distances with gear knows that ounces lead to pounds. However, weight is not a primary concern for most users. Size, on the other hand, can be a huge factor for some people. Hunters who don’t want to carry a pack will need a monocular that fits easily into a pocket or that can be worn on a lanyard. While most monoculars are rather small, to begin with, some are definitely smaller than others. There are several that weigh mere ounces and are just a few inches long. As long as the power you need is available, smaller will tend to always be preferable. The downside of that is that the most powerful monoculars are only available as larger models. When you do find a small, powerful monocular it will often be far costlier. If you are willing to pay the additional price, you can be sure to get the most usable monocular. Smaller monoculars also tend to be more durable. The size and weight decrease the impact of any drops and the smaller overall surface area decreases the chances of adverse impacts from weather. All of the above points considered, many people prefer a larger monocular that fills the hand better. They feel they get a more secure grip and have an easier time pointing the monocular accurately. While this is not universally true, it is often the case. 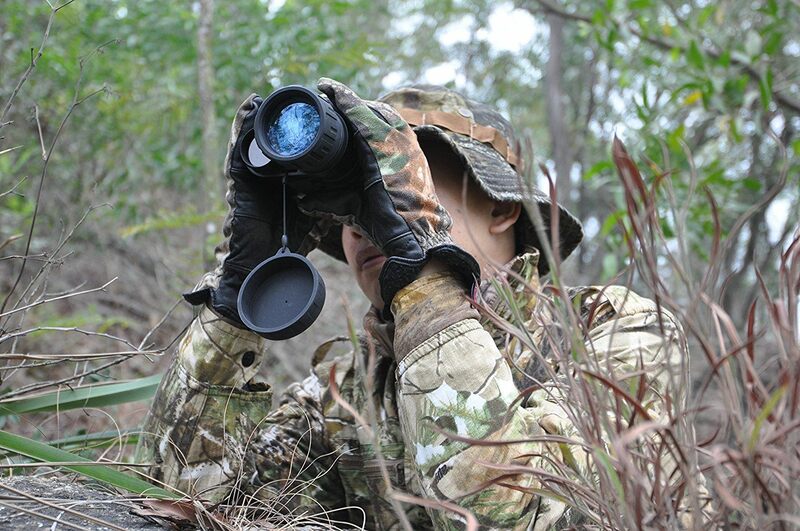 Larger monoculars are often easier to aim at a target, especially at a distance. There are hundreds of monoculars made by dozens of companies around the world. Many of them share the same glass and a few even share the same lens treatments. However, the function is all on the company producing the final product. If you are out for the best monocular, you need to get it from the right supplier. We have done our best to pick leading products from manufacturers that are well regarded in the optics industry. Not all of them are high-end producers that are known to be the cream of the crop. We wanted a range of monoculars of different prices that brought a lot of value for their quality. In their price range, each of the monoculars above could be considered the best monocular in it’s class. They will all do an admirable job and last for years with proper care. Anything short of that would be a subpar product and not worthy of a spot on this list. While there are many monoculars that we passed over for various reasons, a number of companies produce fine monoculars. Just not for the dollar for dollar value of the products above. These have the reputation to back up their performance and would make a fine addition to your kit. Enter your email address to subscribe to Outeroptics and receive notifications of new posts by email. Outeroptics is a participant in the Amazon Services LLC associates Program, an affiliate advertising program designed to provide a means for sites to earn advertising fees by advertising and linking to products on amazon.com.